Jedlie’s Magic Circus is fun for the whole family. Please visit www.jedlie.com to find out how to bring this inspiring show to your community. Hello, our dear listeners! Today, we’re ELATED to welcome author Laura Day to talk about her latest children’s book, My Special Mind. 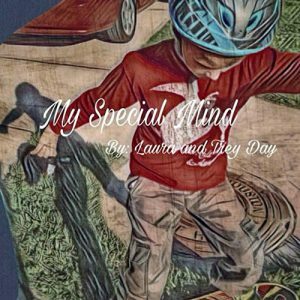 My Special Mind is a heartwarming story about embracing differences and an eye-opening glimpse into what a child with a Special Mind goes through and deals with on a daily basis. To learn more about the inspiration and hard work that went into My Special Mind, we reached out to Laura for an interview. In this episode, Laura talks about what attracted her to children’s literature, what inspired her son to share his point of view on his daily struggle as a child suffering from ADHD, her inspiration for her story on Special Needs and Disability Awareness & much more. Tune in now! My name is Laura Day. I’m a special education teacher, and also this handsome man’s mom. The strapping young gentleman standing next to me is Trey Day. Trey is diagnosed with severe ADHD, ODD, Epilepsy, and sensory sensitivities. With all of this comes challenges. I would always hear grumbles from him about how “he just can’t do this or that”. I wanted to find a way to inspire and empower him to prove to him that anything is possible if you put your mind to it, and work hard for it. We sat down together and I had him make 2 lists. 1 list for all of his successes, and another list for all of his struggles. I took those 2 lists and created this beautiful story. “My Special Mind” started out as a project just between us, a special way for us to bond. After reading the finished story, I soon realized that this book was truly something special and felt compelled to share it with the world. Trey’s perspective on daily life and his thought process is felt by so many children and adults alike. That’s what makes this book unique. “My mind is always with me, thinking, and creating fun things to do and see. That’s what’s so special about me”. All too often children with ADHD feel as if the focus is always on correcting or highlighting the negative behaviors associated with having ADHD. As an educator and a mom with a child who has ADHD, I wanted to bring acceptance to certain attributes of having ADHD. “My Special Mind” is a book all children can relate too. Having ADHD can be fun, exciting, and adventurous. An ADHD mind is a special mind. “My Special Mind” is a great reminder of how special everyone’s mind truly is. My son and I embarked on this special project, where he takes the reader on a journey inside the mind of ADHD. Buckle up, an 8-year old’s mind is definitely an interesting place to be! Thank you, Laura, for joining us and for sharing your wonderful story with us! If you love this episode then please share and please subscribe to us on iTunes. And please spread the word: tell your friends, and leave a rating on iTunes so that others can find it. We’d love to hear from you! Contact us and together we can discuss what ideas you think should be included in a future episode, and we can explore potentially setting up an interview. Our goal is to have all voices at the table! 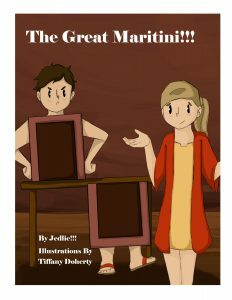 Check out The Great Martini, A fun and touching story about Sam, a lovable but far from a perfect magician who learns that the greatest transformation is transforming feelings of caring into action to help another human being. The Great Maritini, as an exclusive Amazon e-book. Please click here to get your copy today. PreviouslyLet’s Discuss Historical Fiction with Leslea Wahl! Read NextJoin The Stupendous Adventures of Mighty Marty Hayes! !